Edward surprises Kara with the bicycling-around-the-world trip she’s been planning for years, failing to inform her that it’s a flight response from being let go from his position and blacklisted in the financial sector. On the US leg of the tour, Edward is offered a job by a host, who insists on an earlier starting time than Kara’s expected two years, forcing Edward to speed up their trip without explanation. In alternate chapters, Italian Alessio and Japanese Hirosama have traveled to the present from earlier centuries and are connected to Kara, as are the Native American and French-Canadian Edward and Kara came across in the American Midwest. 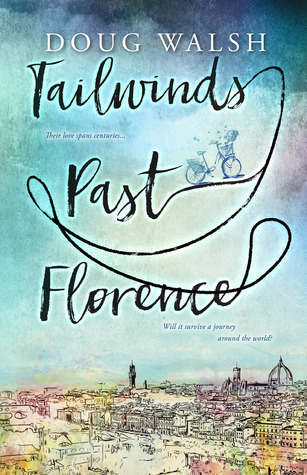 Alessio works for Hirosama in Florence as Edward rushes Kara through Europe. In Florence, things reach a breaking point when Kara’s life is endangered and Edward must make a life-changing decision. Walsh portrays well a marriage unraveling from Edward’s hidden agenda, and the confusion wrought by a supernatural experience. While the paranormal aspect brings intriguing elements, it’s superfluous, as Edward’s subterfuge provides a sufficient story arc, and those elements are not explored. However, they could make for an interesting series, with sequels going deeper into the stories of Allessio, Hirosama, the French-Canadian, and the Native American. Dear reader could then find out what happened to the Native American, who was but a footnote in this tale. I received a digital copy of this fascinating story by the publisher Snoke Valley Books through a Goodreads giveaway.